While the world has focused on arm twisting China and some Far East nations to have them stop ivory markets and help salvage African elephant numbers, it has now emerged that trade in illegal ivory is rampant in Britain, in some cases with the knowledge of the British Government, Africa Science can authoritatively reveal. It is understood that ivory (whether raw or worked) continues to be traded legally within UK and the other EU Member States, in auction houses, markets, shops and online – and that antique items can even be traded without permits or certificates. 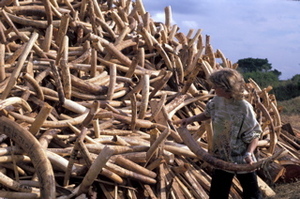 The existence of legal ivory markets and exports provide opportunities for laundering illegal ivory. The existence of these markets and exports also fuel demand for ivory within the UK and abroad and thus contribute to poaching. While the world has been made to think that poaching of African elephants is a Chinese problem, on the contrary, the UK appears to be harbouring bad elements that use the existing licensed market antique ivory as a cover for trade in illegal ivory. It is however disturbing that although the CITES Parties had agreed by consensus at the 17th Meeting of the Conference of the Parties, (CoP17) in Johannesburg, South Africa in October 2016 that, legal domestic ivory markets contributing to poaching or illegal trade should be closed as a matter of urgency, the UK could still be overtly be running such markets. It is now clear, that the same kind of pressure that the world has exerted on China be mete on the UK. The results of the pressure has been tremendous. For example effective January 1, 2018, China banned the mainland domestic sale of elephant ivory and related products, a significant move toward slowing the annual slaughter of the largest land animals on Earth. The UK should be made to follow suit and be told in no uncertain terms that it must ban its ivory trade and fully implement the CITES recommendation to close domestic ivory markets. By 2014, the total elephant population in Africa stands at fewer than 500,000– an incredible decline. Gabon, which has among the largest remaining herds of forest elephants is down from about 80,000 to fewer than 40,000 today. A recent elephant censuses by Kenya showed a not encouraging picture of elephant population. According to the census, a total of 7,347 elephants were counted.